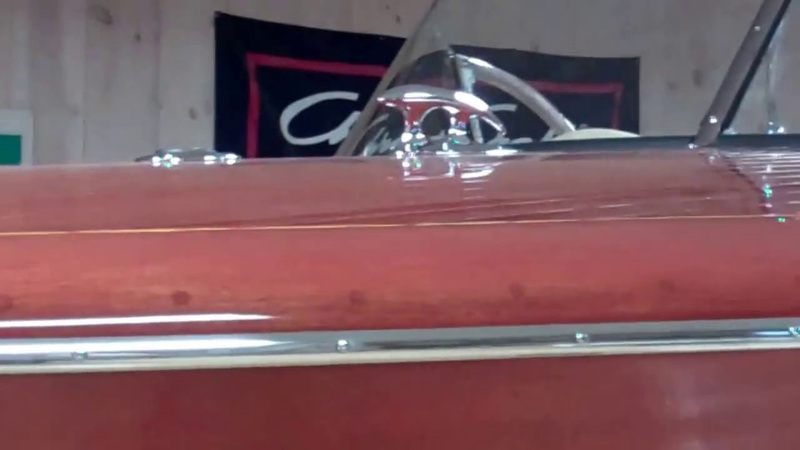 My 22’ 1953 Shepherd Model 110-S Runabout’s preservation is so, so close to the finish line! I have decided, therefore, to enter Flyin’ By, my 1938 19’ Chris-Craft double cockpit forward special runabout in her place. Over the winter we will have Mickey Dupuis – D&S Custom Metal Restoration in Holyoke, MA – restore and plate all of her hardware anew. While the hardware is at chrome, we will strip the bottom to bare wood, and refinish it as a traditional bottom. All surfaces will receive three coats of CPES, followed by the first of five coats of Interlux 2000E two-part barrier coat. The seams will then be filled with Interlux below-waterline seam compound before the subsequent four coats of 2000E are applied. Next comes two coats of Pettit Tie Coat Primer, which will be followed by at least four coats of brilliant red Epifanes Monourethane. The transom, topsides and decks will be carefully hand-sanded, starting out with 400 grit, before we apply 6 – 8 coats of Pettit Hi-Build varnish. Once the varnish has cured for 30 days, we will buff it as we did Voodoo Child. My betting is that we have some very late nights in our future! Next PostNext 1959 Chris Craft Sportsman Porcupined!